I don't want this to stray too far into general workflow/navigation tips, but as I mentioned that there was no way to turn off a set of specific Deformers via Layers I will describe a way to quickly access groups of objects to manipulate them. Selection Objects will definitely be familiar to character animators, and their functionality is a little deeper than I will explore here; read up about them properly, the keyframe selection stuff is very useful. The basic premise is to create an object from a specific set of selected objects then access that same selection at any time. If those objects are of the same type (in this example Deformers) then shared attributes can be quickly controlled. I was trying to create a Layer based setup for this large hierarchy, the deformations were very heavy running through dynamic 'falloff' Vertex Maps (via Additional Effectors). You can read why this didn't work in the Layers section, but basically Layers can't control the 'Enable' of Deformers directly. I still needed a way to turn these sets of Deformers on and off quickly, of course an Xpresso Proxy Setup is powerful and flexible but sometimes there are quicker methods. 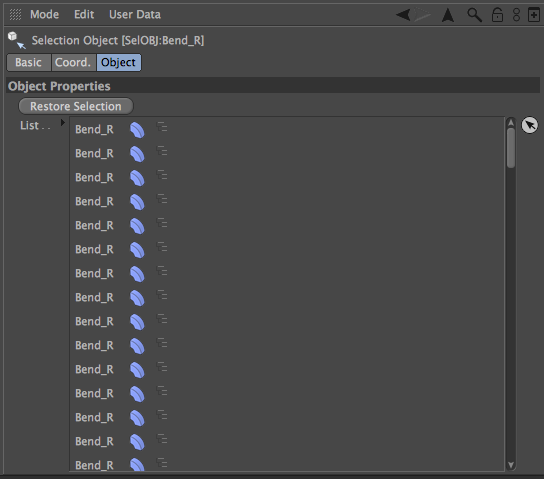 By selecting each "Bend_R" then creating a Selection Object I could simply double click on the object at any time to select them all again, therefore being able to disable all "Bend_R" objects. I then repeated the process for "Bend_L" and "TaperFFD".